Deal Physical damage to target enemy. If the Ghost is Stealthed, this attack is guaranteed to be a Critical Hit. All enemies have -25% Potency. Whenever an enemy debuff is Resisted by an ally, Ghost inflicts Speed Down on that enemy for 2 turns. This effect can't be Resisted. Additionally, while Phantom II is present, the Ghost cannot be Target Locked. When Phantom II is defeated, Ghost gains Protection Up (50%) for 2 turns and 100% Defense until the end of the battle. Enter Battle: Inflict Critical Chance Down on all enemies for 2 turns and inflict Target Lock on enemies who suffer from Ghost's Critical Chance Down, which can't be Evaded or Resisted. The Ghost and target other ally gain Stealth for 3 turns. Then, call target ally and two Rebel allies to Assist, dealing 40% less damage. 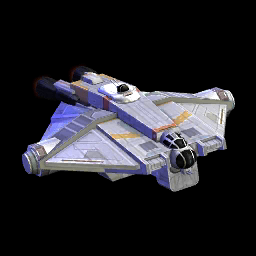 Deal Physical damage to all enemies and deal 40% bonus damage for each Rebel ally. Target Lock: Inflict Ability Block for 1 turn. Inflict Defense Down to all enemies for 2 turns, which can't be Evaded. Expose target enemy for 2 turns, which can't be Evaded or Resisted. The Ghost gains 30% Turn Meter for each debuffed enemy.